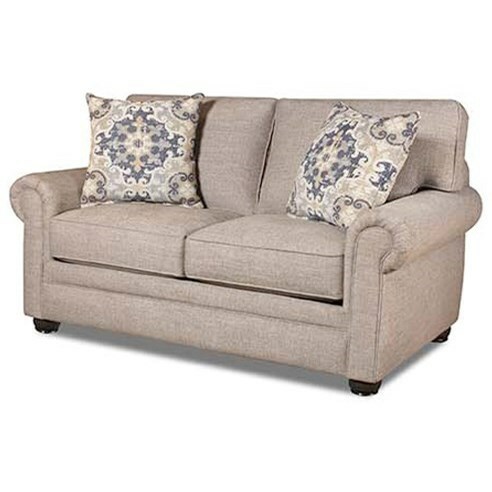 Affordable fashion is within reach with the decorative look of this upholstered loveseat. Its features include rolled arms, and bun feet. Pair with other items from its collection to create a complete set. The 97C0 Loveseat with Rolled Arms by Corinthian at Miskelly Furniture in the Jackson, Pearl, Madison, Ridgeland, Flowood Mississippi area. Product availability may vary. Contact us for the most current availability on this product. The 97C0 collection is a great option if you are looking for Traditional furniture in the Jackson, Pearl, Madison, Ridgeland, Flowood Mississippi area.